Looking for a painfully challenging game for your Windows Phone? Give Solvr a try. 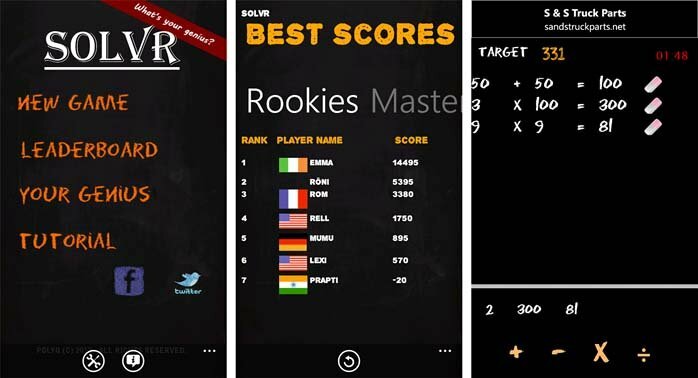 Solvr is a math game where you are given a group of numbers and a target value. You have to match the target value by adding, subtracting, multiplying or dividing the provided numbers. It sounds easy until you get started solving the puzzle. Solvr's Main Menu has options to play the game, view the online leaderboards, view your stats, and to view the tutorial page. At the bottom of the Main Menu you will find two button controls to access the settings and the about screen. Settings cover the game's difficulty, your player name (for the leaderboard) and sound effects volume. From the three-dot menu you will find your options to share the app, review it in the Marketplace and view other games from the developer. The game page is designed like a chalkboard with your Target Value in the upper left and a timer (did I mention you have to solve the puzzle in two minutes?) in the upper right. At the bottom of the screen is your group of number and your mathematical functions. Just tap on the numbers and functions to create an equation. The sum of that equation is added to the remaining numbers. You repeat the steps until you create an equation where the sum matches the Target Value. Equations must result in whole numbers. A eraser will appear to the right of each equation to let you erase things and start over should you make a wrong turn with your calculations. When you fail to solve the puzzle (the time expires or you run out of numbers) you will be given the option to play again or view the solution. Here's a quick example. The Target Value is 105 and you are given the numbers 3,5,6,6,50,50. The equation string to reach 105 will be: 6x5=30, 50x3=150, 50+30=80, 150/6=25, 80+25=105. 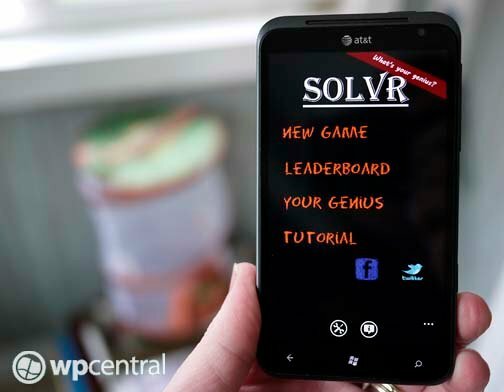 If you like math puzzles and are up for the challenge, Solvr is a free, ad supported game that you can grab here at the Windows Phone Marketplace.